The number of classes at the U of S with fewer than five students is on the rise and what to do with low-enrolment programs is a topic that needs to be discussed, according to the chair of Council’s Planning and Priorities Committee. "We know that about 10 per cent of the classes offered at the U of S have fewer than five students enrolled," said Lisa Kalynchuk. "It is an issue that University Council is ideally suited to address; it falls exactly within Council's mandate to lead academic programming." To examine the issues, an enrolment subcommittee has been formed and charged with updating a Council-approved policy from 2007 that addresses programs with low enrolment. "We need to update this document, identify key metrics and determine if it still refl ects current thinking about program enrolment," said Kalynchuk, a professor of neurology in the College of Medicine. She added there is a sense that the number of low-enrolment programs at the U of S is disproportionately high, so the subcommittee's first step will be to determine the magnitude of the situation. While the number may be high, some low-enrolment programs are offered for good reason, continued Kalynchuk, who chairs the subcommittee. "Some of these are offered because they support the provincial knowledge economy; some programs historically have outstanding students year in and year out and are prestigious; some support valuable research enterprises. Maybe we want to keep offering these programs with low enrolment, but we need to have the discussion and engage Council members to see what their thoughts are." Chief among the issues to consider around low enrolment, she continued, are resources, student experience and how comparator institutions deal with similar classes. The job of the subcommittee is to determine the landscape outside of the U of S, and to gauge how students feel about these programs and their experience in them. "We are trying to fi nd out how comparator institutions in the U15, like Dalhousie and Queen's, and regionally, like University of Calgary and University of Manitoba, deal with low-enrolment programs." The subcommittee will also look at a few institutions that focus on undergrad programs "to see if it's different at a less research-intensive institution." Playing perhaps the most important factor in this, she continued, are the students and their perspectives on smaller programs. "We want to talk to them and see how they feel about it—why they went into the programs, why they didn't go into the programs. We want to know how they would rate their experience in big versus small programs." There is a sweet spot, an optimum number, for student enrollment, continued Kalynchuk. "We're not talking about 500 students in every class, but also not three or four. Can we reach equilibrium of 20 to 30 students in second, third and fourth years and avoid classes with fewer than five? What's the optimum number?" The educational experience for students is really driving this process right now, she said, using her own experience as an undergrad as an example. 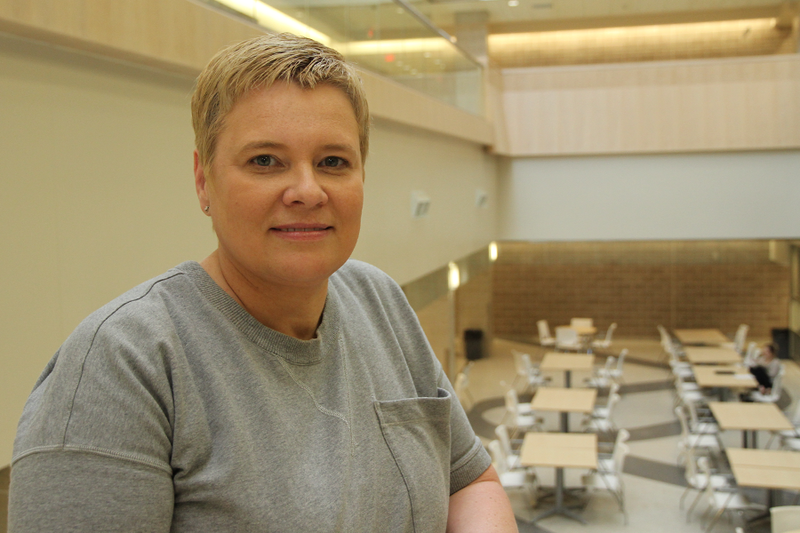 "I had a lot of students in my program and really benefi tted from that. It contributes to a vibrant student cohort; students support each other and develop friendships." Kalynchuk is clear that what the subcommittee hopes to present to Council this fall will be "guidelines and principles that can help deans and department heads make decisions about these programs. This will not be prescriptive, but it will tell them what issues to think about to inform their decision making." The subcommittee hopes to get a policy endorsed by Council this fall so that it can start being used by deans and department heads in the upcoming year. "This is a timely discussion to have and Council can help decide what kind of academic experience we off er students. We have limited resources and the more classes we off er with fi ve students means the more classes we have to off er with hundreds of students. So let's make it about academics and student experience before it becomes about fi nances," said Kalynchuk, adding that a new Council-endorsed policy will prove especially important once Transparent, Activity-Based Budget System (TABBS) rolls out to college and departments. "TABBS will tell them (deans and department heads) what a breakeven number of students is for a class to be feasible. What the cost is for a full professor to teach a three-credit unit course. Each college and department will be responsible for all those costs and that could make decisions more focused on fi nances.